Down the centuries,cloth has been a widely used base for artistic expression across the Indian sub-continent and South and South-east Asia. Cloth as a base for artistic expression in the form of “narrative scrolls” can be dated to 9 th-12 th century AD. 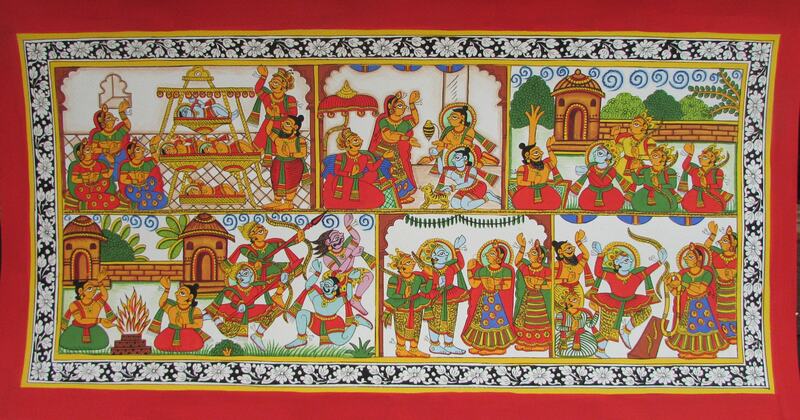 The patachitra or cloth art of Bengal (West Bengal and Bangladesh) and Odisha depict oral traditions of the region. The painters used natural vegetable and mineral colours. The Odisha patachitra scrolls mostly depicted Lord Jagannath of Puri.But various other themes, such as temple activities, different mythological stories about Radha and Krishna and scenes from the epics, like the Ramayana and Mahabharata were also depicted. The Bengal patachitra began as a profession from around 10th-11th century AD. As professional artists, these scroll painters would frequent residences of wealthy landlords to narrate stories from the scrolls and be rewarded in cash or kind. The narration used to take place through a simple lyrical verse as the chitrakar unrolled the scroll gradually. There are regions of Bengal which are noted for unique forms of cloth art, such as Medinipur, Purulia, Birbhum and Bankura as well as the city of Kolkata. The subject matter varies between the Indian epic Ramayana and local Puranas- Dharmamangal Kavya, Manasamangal Kavya and Chandimangal Kavya. The Manasamangal Kavya is one of the most famous stories. Over the last several decades, however, the subject matter of the chitrakars has expanded to include various contemporary topics- e.g. afforestation, vaccination, girl-child education, anti-dowry messages, environment protection messages and so on. This has been through the efforts of various governmental as well as non-governmental agencies to employ the chitrakars as a medium of mass communication to reach a larger number of villagers on socially relevant topics. The Thanjavur paintings from the South Indian State of Tamil Nadu go back to the period between 16 th. and 18 th centuries. They had a colourful panel of figures painted on a wood plank with a single deity as the main theme of the composition. The deity had almond-shape eyes with the figure being enclosed by an arch or a curtain. The speciality of Thanjavur paintings is the use of gold leaves and semi-precious stones. This is referred as the gilded and gem-set technique. From the 20 th.Century onwards, Thanjavur paintings were influenced by migrant patachitra artists from Bengal. The migrants infused the locally prevalent Kalamkari style with patachitra patterns from Eastern India. These gave rise to large narrative works on cloth for temples and also scrolls. These were used as a medium by travelling storytellers. The small village of Cheriyal close to Hyderabad in the state of Telengana has scroll paintings which show the strong influence of Thanjavur. The scrolls are done by the people of Kaki Padagalu nomadic community who paint mural backgrounds, fishing, farming and other village scenes. The Chitrakathi scroll painting tradition is prevalent in Maharashtra, Karnataka and Andhra Pradesh. (‘Chithra’ meaning painting and ‘Katha’ meaning story). Traditionally, these told stories from the Hindu epics. There were leather shadow puppets, wooden string puppets and picture stories. At present, Parashuram Vishram Gangawane is the only surviving Maharashtrian narrator of Chitrakathi. He hails from the village called Pinguli near Kudal in the Sindhudurg district of Maharashtra. Scrolls from Rajasthan from Western India, called the Phad, also tell stories. Traditionally done on a long piece of cloth, these were folded and carried as a “travelling temple”. The term Phad means folds in the local dialect. The Phads narrate stories of local folk deities of Rajasthan, mostly Pabuji and Devnarayan, though, lately, stories from the Indian epics, the Puranas and the mainstream Sanskrit literature, are also exhibited. 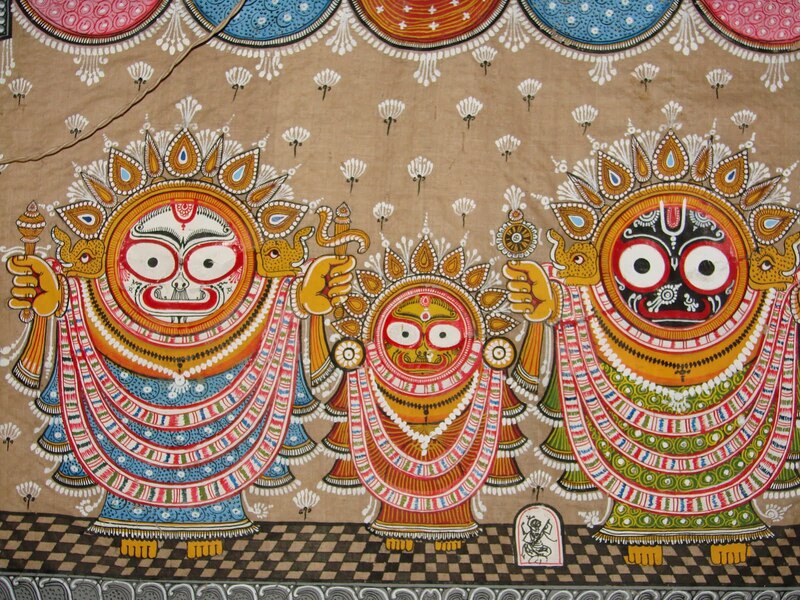 Each scroll of Pabuji used to be 15 ft long, while that of Devnarayan would be 30 ft long. 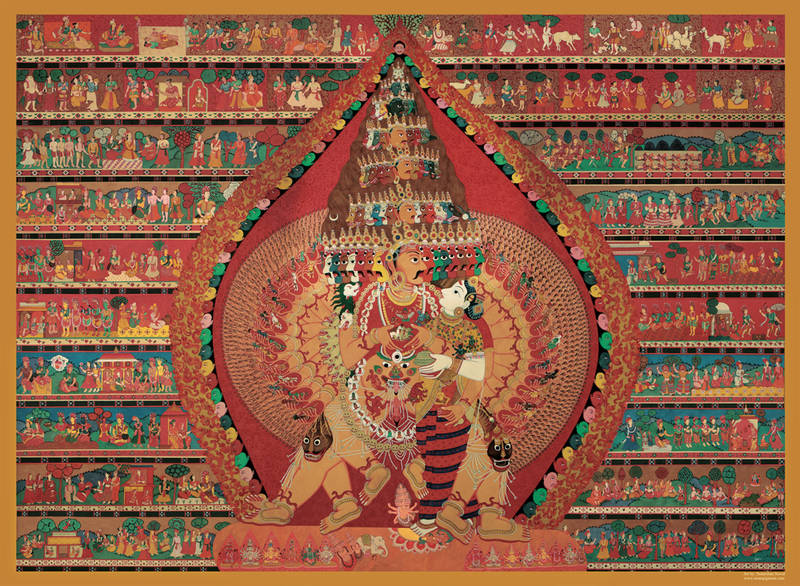 Scroll paintings from the Himalayan region comprising Nepal, Bhutan and Tibet have had a major influence of both Hinduism as well as Vajrayana Buddhism. The scrolls are referred as pata in sanskrit, torana or paubha in Nepali, and thangka in Tibetan. The Bhutanese thangkas were mainly influenced by Central Tibet. The thangka of Tibet dates to the 13th century and were strongly influenced by Buddhist ideologies. But the Newari paubha of Nepal principally highlighted Hindu deities. 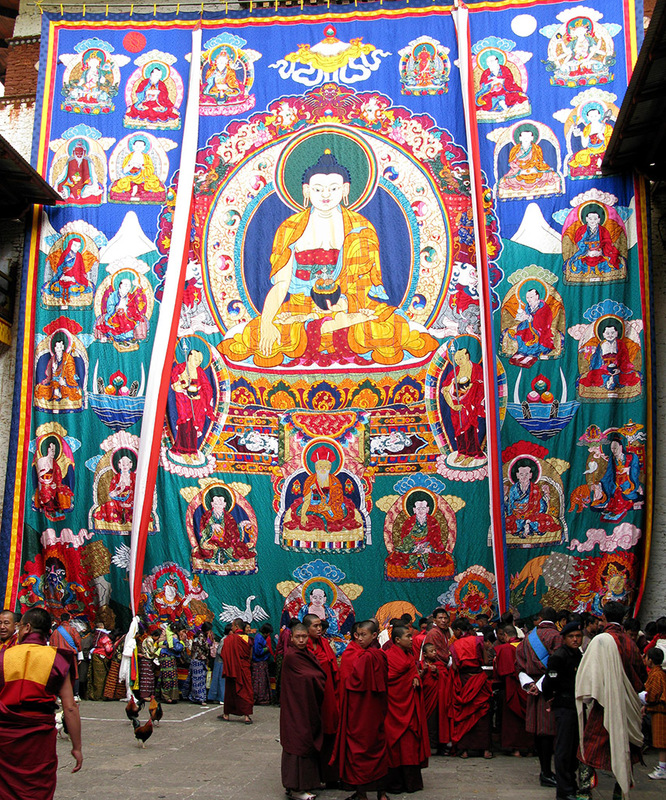 The canvas used by the thangka, the pat and the torana were different. While the pata as well as the torana were a long succession of paintings, a thangka was a single complete painting with a central theme. Traditionally, the paintings were made with chalk or other mineral powders of primary colours and glue on primed cotton cloth. Finally, after finishing, a varnish of egg-white and water was put to preserve the paint. In Sri Lanka, scroll paintings on cloth are called as pettikada. These narrative scrolls had the Buddha surrounded by a thousand Buddhas or various tales from The Jatakas. Though there is still no record of pettikada scrolls as an performing art like the ones from Bengal, the magnificent collections at the Colombo National Museum speak of great artistic talent that went into their creation. The pattern and format of paintings, use of colours and brush strokes resemble an amalgamation of the patachitra arts from Bengal and Odisha as well as the Tanjavur scrolls. The pettikada dates from the late-Kandyan period. Theravada Buddhism of Sri Lanka is represented through the pettikada in other parts of South Asia. 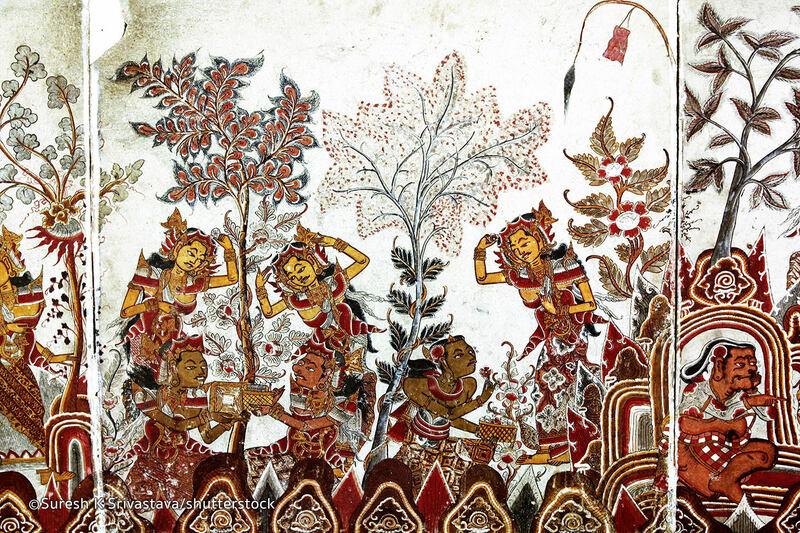 The only examples of cloth painting come from Arattana Viharayas and Maha Visnu Devale in Hanguranketa. A characteristic feature of these paintings is the outlining of all forms with a clear black line and the occasional use of small quantities of green or white in the detail of ornaments which impart the necessary softening required to harmonize the strong reds and yellows and reduce their extreme brilliance. The floral and vegetable designs are seen on the ceilings of Lankatilaka, Gangaramaya and Dalada Maligava. These paintings are not mere decorations but priceless pieces of history. The stories of the narrative scrolls across the Indian sub-continent and South-east Asia indicate not only cross-cultural connectivity, but influences of various religions, traditions and languages. They travelled on the shoulders of merchants and pilgrims from the 8 th or 9 th. century onwards from the Indian sub-continent especially from Bengal and Odisha. Both Bengal and Odisha had important ports which connected with the rest of South and South-east Asia, including Burma, South China and the Malay Peninsula. The stories from the narrative scrolls reflect the many waves of migration and travels.They acted as a breather amidst the busy life of the various communities. Through them marginalised sections of society were able to listen to tales of the epics and the puranas.